I did not plant the bright pink petunias that I found growing out of a pot of climbing mandevilla late this summer. Yes, I had noticed some unplanned greenery starting to sprout up in that pot on my deck. I assumed they were weeds and being only 3-4 inches tall, they fell low on my weed removal priority list, somewhere behind the thistles bigger than the dog, and the mystery weeds that were taller than me and had already gone to seed. Why would I crawl on my deck on my hands and knees to tweek out some little green shoots when I clearly had much bigger horticultural projects to tackle? 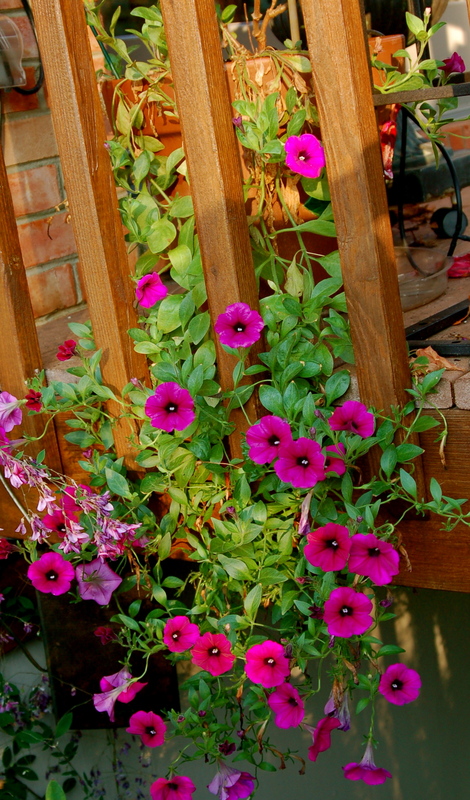 So I forgot about those little shoots and was surprised to discover some weeks later these petunias that were thriving unlike any I had ever planted before, tumbling over the edge of the deck in a riot of ridiculous pinkness. It took a minute to stop congratulating myself on the improvement in my container gardening skills when I remembered that I had never planted those petunias. They were a spontaneous eruption for which I take no credit, unless you count not keeping my containers tidy as an accomplishment. I am left to just enjoy their bright color and envy their gumption and wonder how many things I pull out actually have so much potential and how many things I keep are weeds in disguise. I have often heard and seen the phrase ‘bloom where you are planted,” on greeting cards and magnets and notepads. Mary Englebreit tells us that this is a good idea, and it is. Of course, she also tells us that life is a chair of bowlies, so we take her advice with a grain of salt. Yes, I can keep working to bloom where I am planted. Or I can make like a petunia and plant myself where I want to bloom. Tonight is a hard freeze, so these beauties will be gone. I am glad they stopped by for a visit. My youngest just saw the picture on your site and commented on how pretty the flowers are! Lucky you! When I get “volunteer” plants in my planters, it is almost always tomato plants. There’s nothing like having guests over who are admiring your garden until they discover a cherry tomato in the midst of your planter of geraniums! That’s what I get for being such an avid composter, I guess! I think you can take credit for the flowers. After all, you probably kept the planter properly watered and fertilized. Yep – – don’t tell people you didn’t plant them. Just take full credit for your green thumb and enjoy them! Kris, your tomato volunteers made me laugh, because our most prolific volunteer is tomatillos! I like the idea of planting yourself where you want to bloom. Plants and planting, remain a mystery to me. I have resigned myself to enjoy the few times something wonderful happens! Jan, that’s the best plan for me too! Sigh, I know Joanie, it is hard to say good-bye.